The 950-year old city of Nuremberg (spelled Nürnberg in German) is still alive with history. It is Bavaria’s second largest city, about two hours from Munich and a frequent stopover for people on their way to the southern capitol. This charming city has a castle and whimsical statues and fountains as well as one of the best Christmas markets in the country, but is also well-known for its infamous connection to the Nazi party. There are many highlights of Nuremberg that no traveler should miss — from history buffs and art lovers to culinary travelers and romantics. Here is the best of Nürnberg. The ideal way to explore Nuremberg’s Altstadt (Old Town) is on foot. 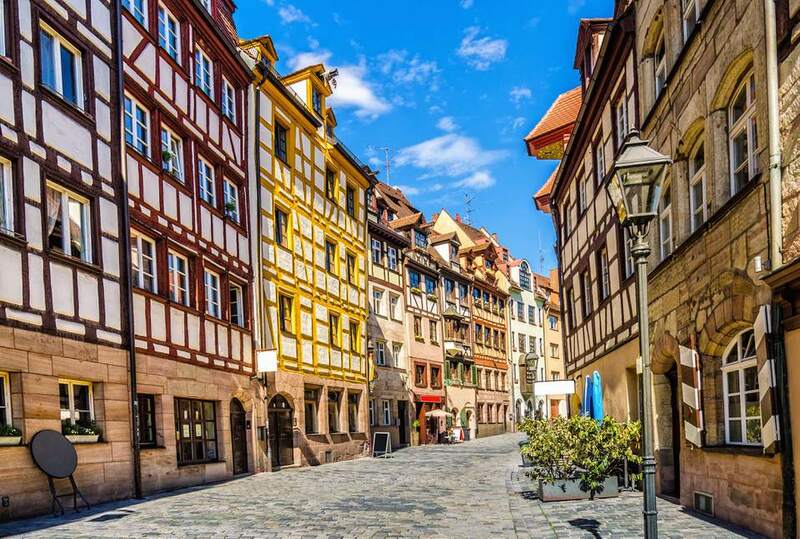 Although much of Nuremberg was destroyed during World War II, the medieval old town has been faithfully reconstructed. One of the main attractions is the original city walls, Stadtgraben (protective ditch), and towers. Not just for show, the walls were first put up in the 11th century and were very effective in deterring invaders. Over the long history of Nuremberg’s fortifications, the city was only ever captured once: in 1945 by the Americans. The best stretch of the walls to walk is along the west side of the town between Spittlertor and what was once Maxtor. Continue through the Burgviertel (castle quarter) which is filled with its sandstone and timber framed houses. The street of Weißgerbergasse is a wonderful example of the impressive craftsmanship. What would a castle quarter be without a castle? Kaiserburg or Nürnberger Burg was a royal residence of Germany’s kings between 1050 to 1571. This impressive castle is one of the most important surviving medieval fortresses in all of Europe. The castle sits atop a sandstone hill presiding over the city. With 351-meter-tall fortifications, visitors can climb up to the observation platform at the castle for panorama views of Nuremberg. Another point of interest in the castle goes the other direction. The Tiefer Brunnen (Deep Well) from 1563 bores down 50 meters into the cliffside. To discover the history of the castle, the Imperial Castle Museum of the Bower showcases medieval weapons and suits of armor. If you want to stay castle adjacent for cheap, there is a hostel in what was once the imperial stables, Jugendherberge Nürnberg. The Schöner Brunnen (beautiful fountain) lives up to its name. Located in the elegant central square of Hauptmarkt, this fountain was designed in the late 1300s to top the nearby Frauenkirche. However, it was so impressive on completion it was decided to keep it within the square to better appreciate its beauty. It even survived World War II intact as it was protected in a concrete shell. Today it stands 19 meters (62 feet) high and its many golden decorations catch the sunlight. A total of 42 stone statues surround the fountain including Moses and the seven prophets at the top, with a big copper ring on the north side of the fence. Legend says you should turn the ring left three times for luck and locals and tourists all visit to the fountain for a bit of gut Glück. The picturesque house he lived and worked in just below the Imperial Castle is now a museum dedicated to his life and work. A master of the self-portrait, his work is prominently on display and the decor matches the time period when he lived here. Guided tours are available in German and occasionally in English for super-fans. Partly damaged during the war, the house was magnificently restored in 1971 on Dürer’s 500th birthday. It is hard to miss both because of the crowds who gather here, and the giant bunny (simply known as "Der Hase" by artist Jürgen Goertz) on the street out front. Adolf Hitler declared that Nuremberg should be “City of the Nazi Party Rallies” in 1933. This legacy still looms large. The grounds and Congress Hall were never fully realized, but are still an impressive site. Modeled on the Holy Roman Empire, this was the place for major Nazi events and parades with grandstands based on the Pergammon Altar providing seating to watch troops goose-stepping across the grounds. There are hours of newsreel footage that show the grounds during their nefarious heyday. The development of this location was stalled as the war continued, and completely abandoned as the Nazi party crumbled. It stood as a sad memorial to this time period for decades and is currently under municipal ownership, perhaps forever in partial ruins. The massive Congress Hall is the largest preserved Nazi building, planned to seat 50,000 people. A Dokuzentrum (Documentation Centrer) within the hall covers the rise and fall of the Nazi Party. In the east wing of Nuremberg’s Justizpalast (Palace of Justice) is a museum dedicated to the notorious trials that took place after World War II between 1945 and 1949. On the top floor, there is a museum about the Nuremberg Trials. Visitors hear about the lead-up to war, individual roles people played, and can even visit courtroom 600. This is where leaders of the Nazi regime were prosecuted for their crimes. The site is still a working courtroom, but visitors can observe this location between sessions. The easiest time to visit is on Saturdays with tours available in English. Nürnberg Rostbratwurst are a very popular sausage in Germany. Each sausage is about the size of a fat little finger, weighing about an ounce and measuring 3-4 inches (7 to 9 cm) in length. Made from coarsely ground pork, the sausages are usually seasoned with marjoram, salt, pepper, ginger, cardamom and lemon powder. This sausage is under the Protected Geographic Indication (PGI) like the German beer from Cologne, Kölsch, or the Spreewald's famous pickle. More than 3 million Nürnberg Rostbratwurst are produced every day and they are eaten around the world. Served everywhere from imbiss stands to biergartens, there is no where better to eat this wurst than in the city of its birth. The best place to eat them is at Bratwurstglöcklein im Handwerkerhof.This restaurant has been cooking nürnberger bratwurst since 1313 and is the oldest sausage kitchen in Nuremberg. Wurst are cooked traditionally, grilled on a charcoal grill and served on the classic tin plate with sauerkraut, potato salad, horseradish, fresh bread or pretzel, and — of course — a Franconian beer. The Frauenkirche (Church of Our Lady) is a focal point of the center of the city off of the Hauptmarkt. Gather here every day at noon to see the "Running Men" clock (built in 1509) strike noon and the moving electors pay tribute to Emperor Charles IV. At Christmas, mount the steps of the church and find the special exhibition of the Christkindlesblick which allows for excellent views from the balcony over the square for a small entrance fee. The Germanisches Nationalmuseum (Germanic National Museum) holds the country's largest collection related to German art and culture. The museum covers everything from toys to armor to scientific instruments in its 1.3 million items, as well as over 300,000 works of art. Among its collection is the world’s oldest surviving globe. Created in 1492, there are stark differences to the globe we are used to today. There is no America on the globe as it had to yet to be discovered by Europeans. Approach the museum from Kartäusergasse and Straße der Menschenrechte (The Way of Human Rights). This street is a monument dedicated to world peace. Tiergarten Nürnberg (Nuremberg Zoo) is one of the largest zoos in Europe at nearly 70 hectares. Founded in 1912 and located in the Nuremberg Reichswald just east of the Altstadt, the zoo is in a former sandstone quarry. These features have been utilized by the zoo to create natural enclosures for animals like the Siberian and Bengal tigers. Also to be observed are snow leopards, bison, maned wolves, South African cheetahs, bottlenose dolphins, bearded vultures, lowland gorillas, and polar bears. The Heilig-Geist-Spital Nürnberg (Holy Spirit Hospital in Nuremberg) is a spectacular site overhanging the canal. It is one of the largest hospitals of the Middle Ages, founded in 1332, and is one of few still standing. It was severely damaged during World War II, but was beautifully rebuilt in the 1950s and is an eye-catching attraction. Step inside the hospital without needing a sick note and dine in the restaurant. They serve traditional Bavarian food in the most atmospheric of environments. The Nuremberg Christkindlesmarkt (Nuremberg Christmas Market) is one of the most popular Christmas markets in Germany. Dating back to the 16th century, the traditional market takes place on the cobblestone streets of Nuremberg’s romantic Old Town. Its organizers keep a watchful eye on the tasteful decoration of the wooden huts (no plastic garlands or taped Christmas music allowed!). Add another Nuremberg specialty to your diet at this time of year with Nürnberger Lebkuchen, a unique gingerbread just made here and shipped around the country. Buy some as a souvenir, or look for traditional ornaments like the Rauschgoldengel (gold angel) or Zwetschgenmännle (prune figure).